Alien-looking plants, chameleons, lemurs, royal tombs, and an ancient sacred fig tree: Madagascar's Sakoantovo forest is truly extraordinary. A new conservation approach combining traditional practices and modern management - a departure from the usual methods of protecting nature by creating national parks that exclude local people - should help this beautiful forest survive. Madagascar's Sakoantovo forest is extraordinary. Skinny green tubes covered in spines grow alongside tall trees topped with tufts of needle-like leaves. Squat baobabs with swollen trunks stand beside tangled masses of thick, thorny, branches. Above this collection of alien-looking plants is a clear blue sky; below, red sand. Venture further in, and the dry spiny forest gradually changes to riparian forest, growing along a riverbed. Here the forest looks more familiar. Tamarind trees dominate, but there are also figs and other plant species. There is an incredible feeling of serenity, the stillness only broken by occasional birdsong and the gentle grunting of lemurs. The local Mahafaly people have known for a long time that the forest is special - for them, it is sacred. The sacred tree is an enormous ficus thought to be 1,000 years old. Its tangled roots and sturdy trunk would not look out of place in Lord of the Rings. Not far away are 2 ancient mounds of rocks and stones - tombs of the Mahafaly royal family. “A long time ago there was a king who had 4 children, 3 boys and a girl,” says Evoriraza. “The king divided up his land between these four children. But the daughter vowed never to leave this place. She said that she would not move away to look for a suitable husband, as is the custom, and that if a man fell in love with her, he would have to come here to live. Eventually she died unmarried, and that is why she is buried here”. Sakoantovo is also very special from a naturalist’s perspective. “This area is a striking example of a transition zone," says Mark Fenn, WWF’s representative in southern Madagascar and an expert on the area's ecosystems. "Along the riverbed you find riparian forest, where the vegetation pumps water from the ground. But this riparian forest is adjacent to a dry spiny forest, with succulent plants that store water. So you have a forest which is taking water next to a forest that is storing water." There are very few riparian forests left in Madagascar. The world’s fourth-largest island has already lost at least 80% of its original forest cover - with over half this loss in the last 100 years. The main culprit is illegal felling of trees for firewood, charcoal, and rice growing. The practice of tavy - a traditional form of slash-and-burn agriculture used to clear forest for rice cultivation - is a particular problem. The Malagasy are the world's greatest per capita consumers of rice, eating on average half a kilo a day. With an expanding population, Madagascar’s forest is disappearing at an alarming rate. Sacred forests are no exception. “The sacred forests of southern Madagascar are becoming smaller and smaller as people farm around them," says Mark Fenn. "What was once a sacred forest might now just be a small patch of vegetation around a tomb or a tree that has spirits." Traditional practices - which in the past have helped protect wildlife - are also eroding. Madagascar is one of the most economically disadvantaged parts of the world, with a climate not always favourable to farming. When people need to eat, taboos on hunting certain species can break down. The forest is already a hardware store and pharmacy for local people; in times of famine it becomes their food store as well. "Many people do illegal things, but they do so out of necessity," says Avimary, a Mahafaly prince. "They are forced to cut down trees to make charcoal, so that they can make a living and earn enough money to feed their children. Cutting down trees is not something they do willingly." The entry of the modern world into Madagascar is also affecting traditional practices. "Some of the younger generations ignore the law and the word of their elders," says Avimary. But Sakoantovo forest could show how to turn this depressing picture around. In June this year, the management rights over the forest were legally transferred from the Malagasy government to the local Mahafaly community. This transfer is not simply symbolic. The idea is that the people who know best how to look after the land are those who actually live on it. The Mahafaly now have the power to manage the forest - something the government had little success with in the past. Illegal felling and collection of medicinal plants had all been on the increase. But now, through local management committees, the Mahafaly have committed to sustainably manage their sacred forest in cooperation with local authorities. This represents a significant departure from previous beliefs that the way to protect forests was to set up national parks that excluded local people. In this new approach, modern forest management mechanisms will be implemented alongside traditional practises and beliefs. WWF celebrated this innovative way of thinking as a Gift to the Earth - the organization's highest accolade for a conservation achievement. Mark Fenn also believes that traditional ways of protecting the forest may be the solution that environmentalists have been striving to find for decades. “One of our principal conservation strategies is reinforcing social cultural traditions, the social norms as it were, which are favourable to the environment,” he says. Indeed, this conservation approach is not really new to the Malagasy. They have a phrase, 'tontolo iainana', which means ‘the world about us’ - a concept of man and nature living together in harmony. This bodes well for the continued survival of Madagascar's forests, as well as its local people and their traditions. * Richard Hamilton is a freelance journalist, based in Madagascar. Riparian forests are areas of forested land adjacent to a body of water, stream, river, marsh, or shoreline which form the transition between the aquatic and the terrestrial environment. These forests have a vital role to play in maintaining the integrity of stream channels and shorelines; reducing the impact of upland sources of pollution by trapping, filtering, and converting sediments, nutrients and other chemicals; and supplying food and cover to fish and other wildlife. Covering an area of 6.6 million ha, the dry spiny forests of southwestern Madagascar form one of WWF’s Global Ecoregions — a science-based global ranking of the world's most biologically outstanding habitats and the regions on which WWF concentrates its efforts. The forests have a high level of endemism, with succulent and spiny plants dominating in a semi-arid environment. It is home to many animal species, including lemur, tortoise, and mongoose. WWF has been engaged in conservation work in the Spiny Forest Ecoregion since 1990. WWF-Madagascar seeks to address the ecological challenges posed by growing human numbers through meeting clear needs for land-use planning, improving land tenure and management, increasing the understanding of the impacts of socioeconomic and gender realities, and improving women’s reproductive health and literacy. WWF works with a broad variety of stakeholders, including local communities, Malagasy NGOs, regional government agencies, and other international development and conservation organizations. 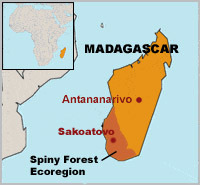 The Mahafaly communitiy, local authorities, and the Malagasy government committed to conserve the sacred forests of Sakoantovo (6,163ha), with responsibility for their management transferred to the local population through an agreement between the Ministry of the Environment, Water and Forests, and local communities represented by their traditional leaders. 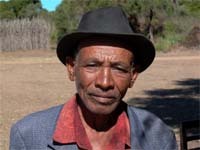 A similar commitment was made with the neighbouring Tandroy communitiy and their sacred forest of Vohimasio (30,170 ha). WWF recognized these 2 initiatives as a Gift to the Earth in June 2003. WWF will continue to work with all the stakeholders to finalize a management plan for each forest and to gain further legal recognition for the areas as "agreed protected areas" or provincial parks. Ring-tailed lemur (Lemur catta) leaping between trees, Madagascar. The sacred fig tree in the centre of Sakoantovo forest, Madagascar. Charcoal production is a major cause of deforestation in Madagascar. Traditional Mahafaly dance at the Gift to the Earth ceremony.